Weaving complicated designs in the 18th C was a very time consuming endeavor. Anything beyond the most simple of patterns required an additional weaver to manipulate the shed (the potential space between the warp threads). There had been many attempts to automate this process. Joseph Marie Charles dit Jacquard (b.1752, d. 1834) was the son of a silk weaver and had many varied careers until the early 1800’s when he began experimenting with new designs for looms that could weave patterned silk. He proposed a series of perforated paper pieces which carried the design formula and were stored on a drum on the loom. 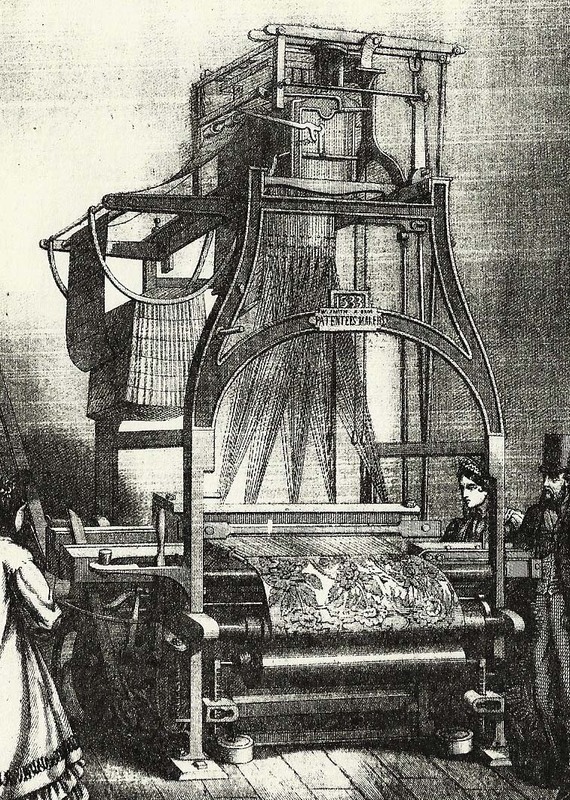 The heddles (attached to hooks and the punched paper) were controlled by this process and one weaver could operate the loom and produce complex cloth more rapidly. One row of punch cards represented one row of woven design. Initial problems with this punch card system were solved by Jean Antoine Breton and the Jacquard loom was further perfected as Jacquard worked with Jacque Vaucanson. Jacquard loom Note the perforated cards hanging to the right rear of the loom. The silk weavers were opposed to this automation, however Napoleon declared Jacquard a “hero” and awarded him a pension and royalty on all looms sold. 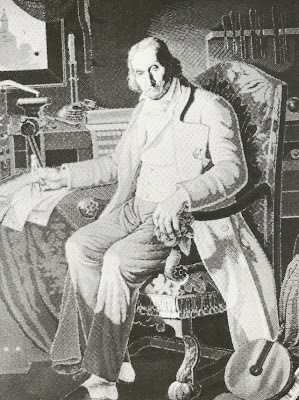 By his death, the Jacquard loom was in wide use and the idea of using punch cards was carried forward into the 20th C for the computer and other office machine industries. The first modern advance in the innovation of this loom used optical scanners to import the design to computers and automatically produced the necessary punch cards. Now, designs are electronically computerized and patterns are stored on disks. Lifting devices are directly hooked to the heddles and , therefore, the loom can easily switch from one complex design to another.